Here you will learn how to make your own wireless "tipping bucket" rain sensor. You can either print the 3D model yourself or MySensorize some cheap tipping bucket hardware found below. The principle behind this is quite simple; When it rains a funnel collects water into two tiny "buckets". When one bucket is full it tips out the water and the second bucket starts to fill up. Each tip is registered and this data is transmitted to your controller. By measuring the funnel opening and bucket size you can calculate the amount of rain that has fallen. Need help calculate your own funnel construction? Have a look here. The DIY tipping bucket 3D model created by BulldogLowell can be found here. The example also contains some optional light, humidity and temperature sensors that can be removed if you want to keep it simple. Big thanks to BulldogLowell and PeteWill for creating and documenting this great project. You can read the background story on the forum. A video showing how to setup your own rain gauge. uint16_t rainSensorThreshold = 50; //default rain sensor sensitivity in hundredths. Will be overwritten with msgTrippedVar2. A few people have reported issues with false interrupt triggers (rain reported on a sunny day). This has been traced back to bad power supplies. The quickest fix is to power this sensor with a good power supply and cable/wire. An alternative fix is to use hardware debouncing. 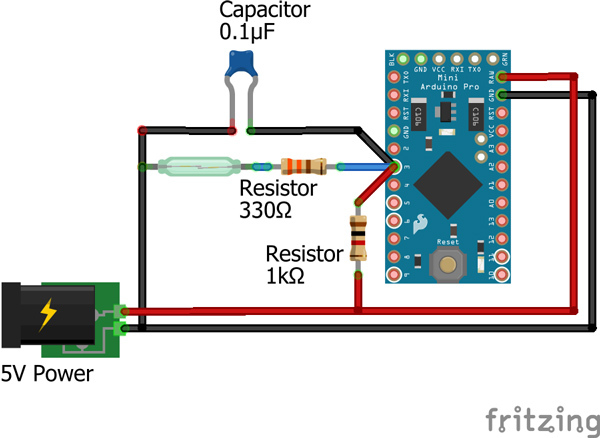 To do this, use the following wiring on your contact sensor/reed switch. For the Pro Minis you'll need one of these to program the module from a PC or MAC. Handles both 3.3V and 5V!